A Year In Review Milestones + A New Format for 2015! SMWLagos > Reports > A Year In Review Milestones + A New Format for 2015! 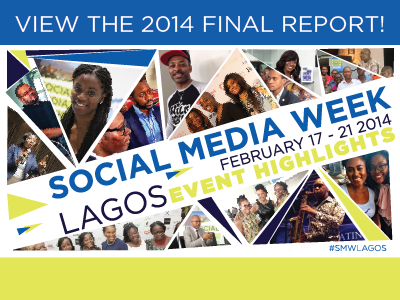 SMW Lagos 2014 was phenomenal and our team is happy to announce the release of our SMW Lagos 2014 Report! Feedback and metrics from the week revealed how our collective efforts made for a historic event that outpaced our 2013 debut. In preparing the report the huge impact of SMW Lagos became quite clear. We are proud that once again SMW Lagos was a game changer for Lagos and the continent of Africa. Please take a few moments to check it out and be sure to share your feedback. *a previous version of this report included a typo which misrepresented the SOCIAL MENTIONS figures for 2014. The error has been corrected. In our efforts to build Africa’s biggest digital media event and create a more dynamic attendee experience SMW Lagos will be moving to a campus model. In 2015 we will introduce a central campus experience, that will feature three main stages, masterclass workshops, co-working/collaboration spaces, private meeting rooms and our first ever SMW Lagos installation and exhibition space. The SMW Lagos team is very excited about the new direction SMW Lagos is taking. Our re-vamped event format will deliver a heightened, more engaging experience for attendees and give our event partners/sponsors an opportunity to shine. Our team is already in planning mode for 2015! We look forward to working with you again to deliver another great week of outstanding programming. Please look to hear from us in the months to come with further details on SMW Lagos 2015. Until then, please feel free to contact us with any feedback you may have.